This is where we are going for the Christmas work party. 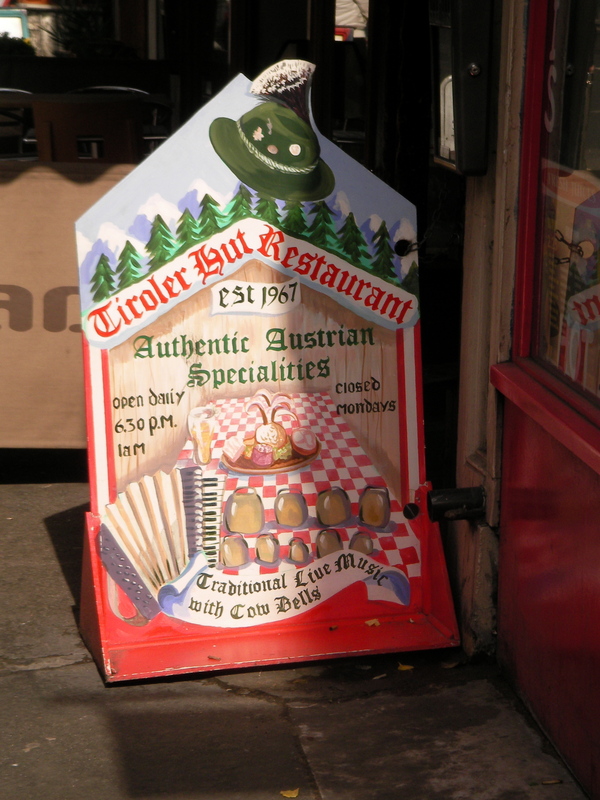 I have no love for the Tiroler Hut and the leiderhosen-clad waiting staff and that man who insists on the cowbell-playing at full volume mid-meal. Deep, deep, heartfelt sigh. 1. My new hair. I have become rather fond of nipping to the Aveda salon of a Sunday afternoon, in order to get: a) a pregnancy massage; b) new cut and colour; and c) a pedicure. Clearly, the only necessary treatment here is the pedicure, because I cannot reach my feet, or in fact even see them. But Go To Aveda I Must, as it makes me groomed and blonder and flushes out the water in my tight sausage calves, and it means that I get a rest from those pesky kids. In the salon, they give you stuff. Like water and cappuccinos and hand massages and head massages and magazines and not one salon staffer asks you to take them to the toilet or for peanut butter and jam sandwiches and perhaps most pertinently, I have never seen anyone from Aveda punch anyone else in the stomach or call them a poo. So I am in total heaven. And if you get small gay 25 year old Irish Stephen to do your hair, he talks exclusively about the X Factor and lets you in on tales of his nose job, botox injections, tooth veneers and cheek fillers, all paid for by his mum. And you cackle and scream a little bit and then you walk out considerably poorer and yet, all the richer. With curly blonde hair. 2. My parents. I would really like them to come and stay in our lounge. I would like them to meet Custard and to watch telly with Noah and the baby while I take Barnaby to school. I would like to go and see some stuff with them, and bring them along to the nursery play and show them the myriad punctuality certificates Barnaby (ahem!) has been awarded. I would like Dad to look at our filing system and maybe apply a little common sense to it. And mum could draw with Barnaby. Maybe they could work out how to stop Noah from biffing bits of food under the couch like a very premature male anorexic. That is perhaps my Christmas wish. Sigh. 3. Alongside a Mulberry bag (as has been discussed) and some money to spend in the January sales. 4. Which brings me to how much I love Christmas in London (even if I haven’t seen a family member in ABOUT 3 YEARS). In New Zealand, it is gorgeous but very different. It is hot, and the beach features heavily, and swimming and baches (a.k.a holiday homes for the uninformed) and dolphins and salads and crayfish and men in shorts and bad sandals are all a big part of it. But here we do get to do things as nature intended. The coldness is ok because it is relatively new, and everyone is enjoying their new coats/scarves/gloves and there are Christmas things aplenty. We have been seeing Santa every week for a month now – in Marylebone (1 hour 20 mins wait, one teddy bear each), in Connaught Village (half an hour wait, box of magic tricks/jigsaw/paint your own racing car), Seymour Street (he didn’t actually arrive but we did get a ride in Cinderella’s carriage) and Selfridges (no wait at all, three of the same books about Paddington Bear). There are a few German-esque markets scattered about, meaning there is no shortage of bad mulled wine and bratwurst sausages. The lights on Oxford Street (although endorsing a Christmas movie) are beautiful, and the window displays in Selfridges are camp and gorgeous. Real Christmas trees are for sale on lots of corners, carollers are dotted about of an evening. It is lovely. 5. Kitchenaid coffee grinder. It stopped working, which has meant having to buy pre-ground coffee. I SCOFF at pre-ground coffee (and I scoff at all the Nespresso-lovin’ in this town but that is another story). So we called Kitchenaid to ask about repairs and guess what? They just GIVE you another new one! A straight swap. Genius. So everyone who lusts after a Kitchenaid food mixer -do it. Yes, it is the price of a small car but you don’t get a new car when you prang your old one, do you??? Hmmm? That is all. The head cupboard/goldfish bowl is bare. This entry was posted in Uncategorized and tagged Aveda, Christmas in London, Kitchenaid. Bookmark the permalink. I like your goldfish bowl nattering… the idea of being away from children in a salon sounds perfect to me… and having your parents to stay – I hope they can sometime.